Friendships are like living things. They need attention and care. They grow. They evolve. They change. Sometimes you meet someone, and it’s a HIT- you instantly love each other and have a close relationship for the rest of your lives. Other times, a person might enter your life randomly, and the friendship ebbs and flows over many years, ending up in a completely different place than it started. My relationship with my dear friend, Liz, is like that. 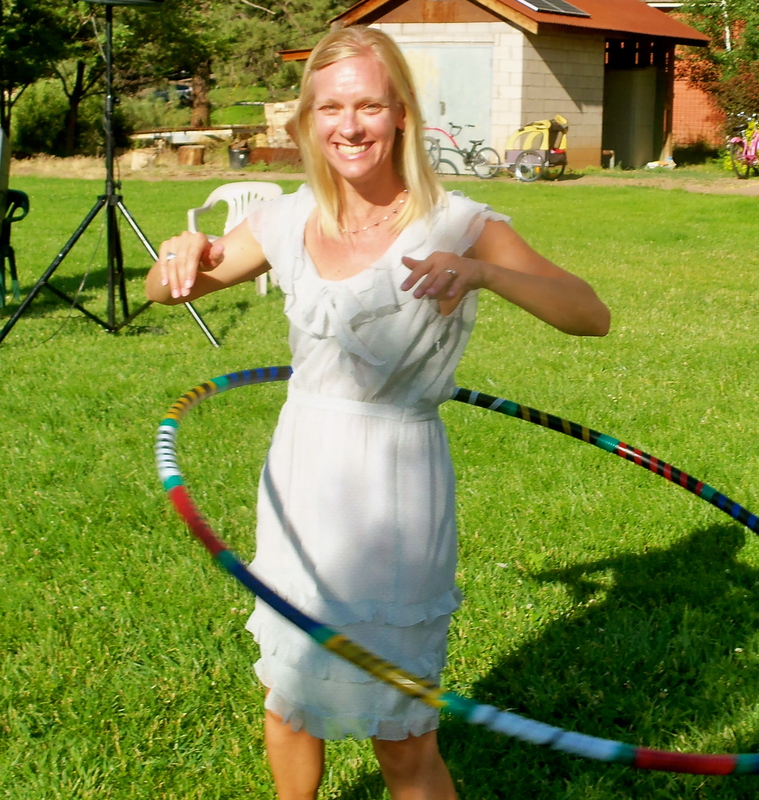 We met YEARS ago in Durango (I’m so NOT doing the math), when she trained me to be a hostess at a restaurant. We knew each other, but didn’t really spend time together outside of work back then. But, our lives overlapped throughout the years in that small town, and our acquaintance turned into a friendship. She married another close friend of mine, further solidifying our places in each other’s lives. 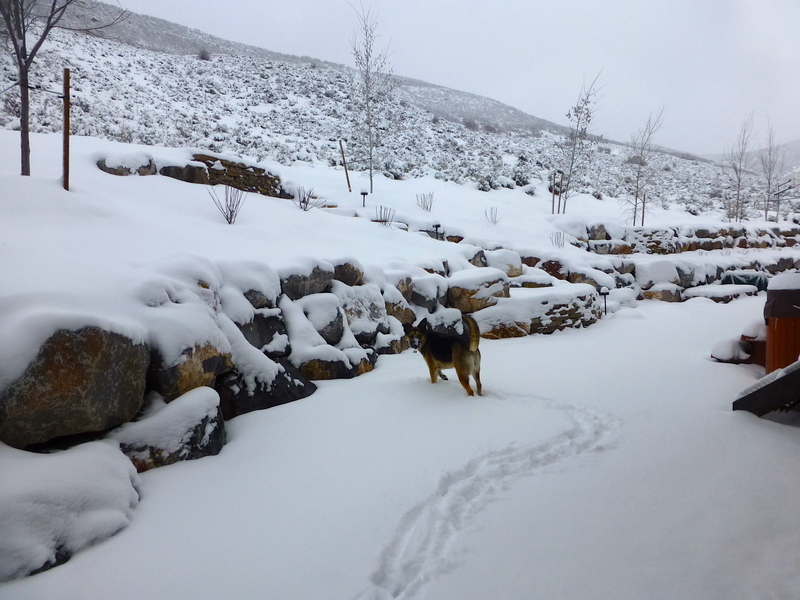 When I moved from Durango to Utah in 2001, she was part of the crew that I felt heartbroken to leave. Despite the fact that we’d lived for years in the same small town with the same group of friends, it wasn’t until I lived in another state that our friendship started to deepen. We kept in touch via email, sharing our day-to-day lives, but also concerns about marriage, money, future kids, work, life. I have discovered what a truly special person Liz is, and I’ve learned so much from her over the years. I try to mimic her laid-back but determined attitude. I envy her ability to manage finances magically. I admire her commitment to her family while putting her heart into her work. And this girl knows how to have FUN. She has been a sweet, supportive, and caring friend to me. 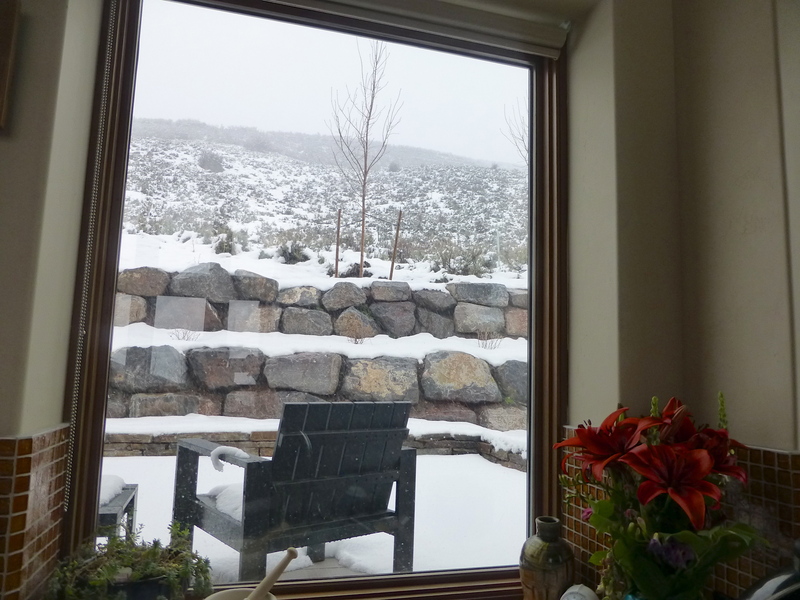 I look forward to spending time with her each time I visit Durango, even when it’s just for a hug and a glass of wine. My friendship with Liz is one of the reasons I’m glad I moved away- because I don’t think it would be what it is today if I hadn’t. Years ago, when the kitchen was still a scary new frontier for me, Liz would send me recipes via email. Her recipes were always approachable and delicious. 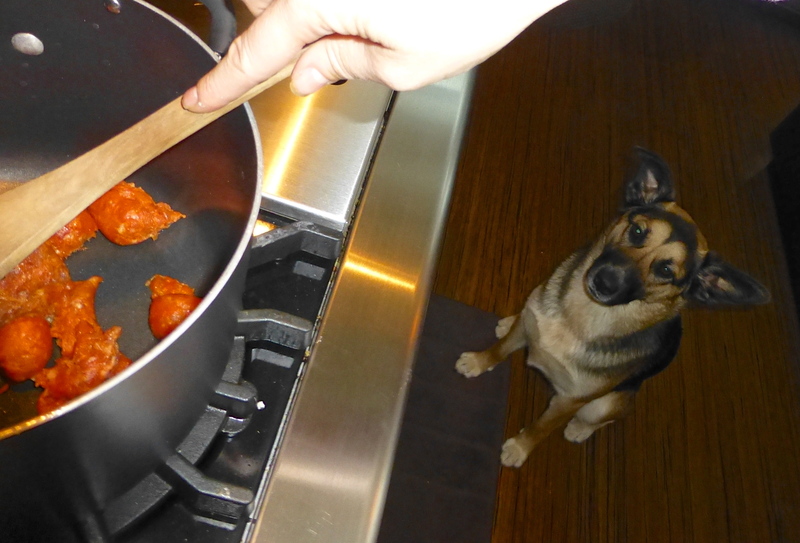 When she sent me the notes for Italian Sausage Soup, I was dubious. 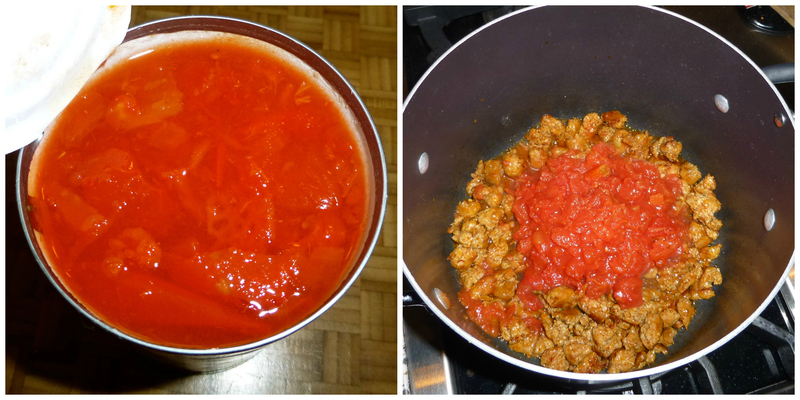 I mean, I love Italian sausage- but in lasagna or spaghetti, not SOUP. I tried it. I loved it. It’s super easy and full of flavor. 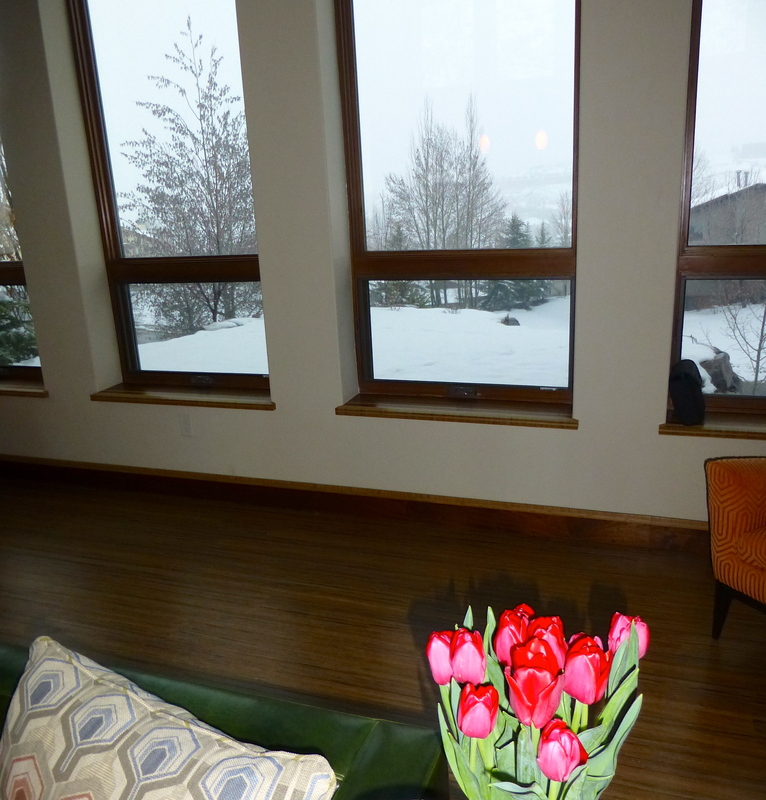 Yesterday, Park City received yet another springtime snowstorm, coating the trees in powdered sugar and warranting a fire in the fireplace. It was an evening that screamed slippers and soup, and I realized that this was one of the last chances I’d have for comfort food. 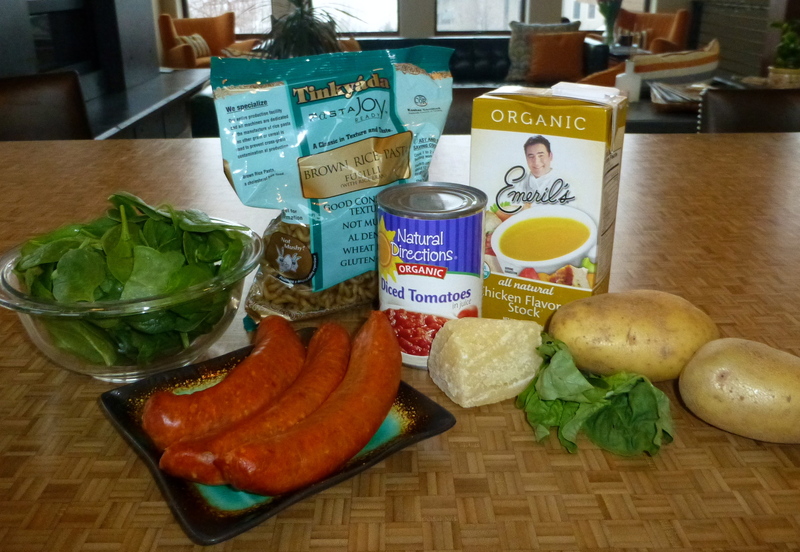 The Italian Sausage Soup sounded ideal! I decided to add potatoes this time, to make it chunkier, like a stew. Usually, I use the ground hot Italian sausage, but when your sweet hubby goes to the market for you on a snowy day, you improvise. 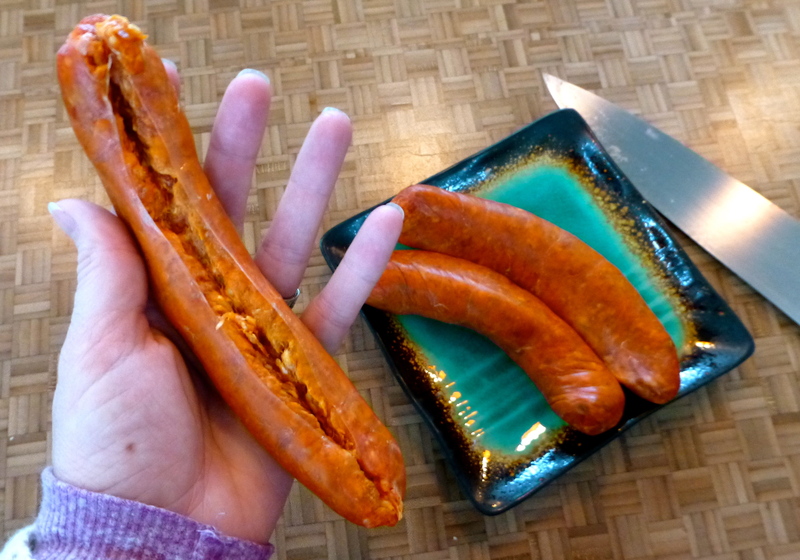 I cut the sausage casings and started browning the meat. 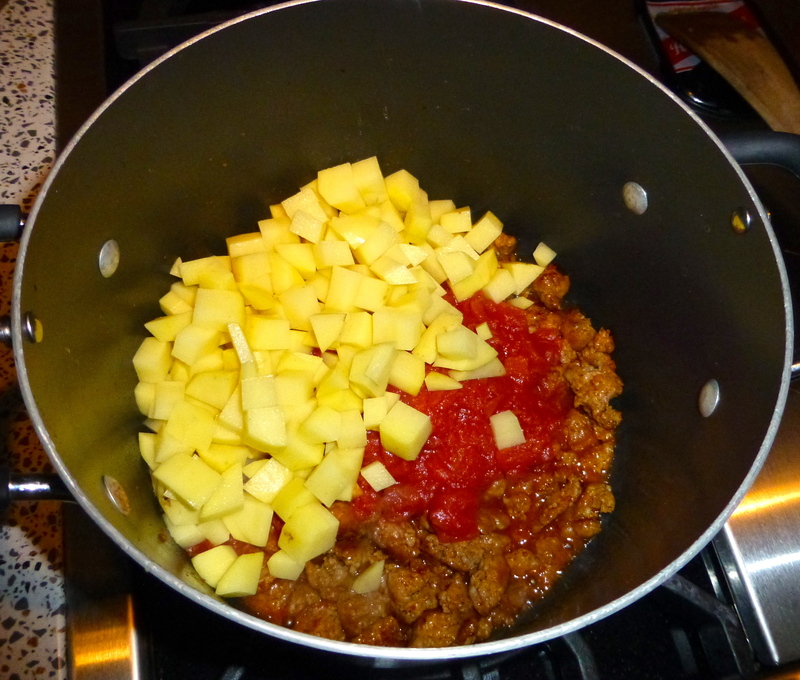 While the sausage did its thing, I peeled and chopped two potatoes and opened a can of diced tomatoes. Prep for this soup is seriously easy. 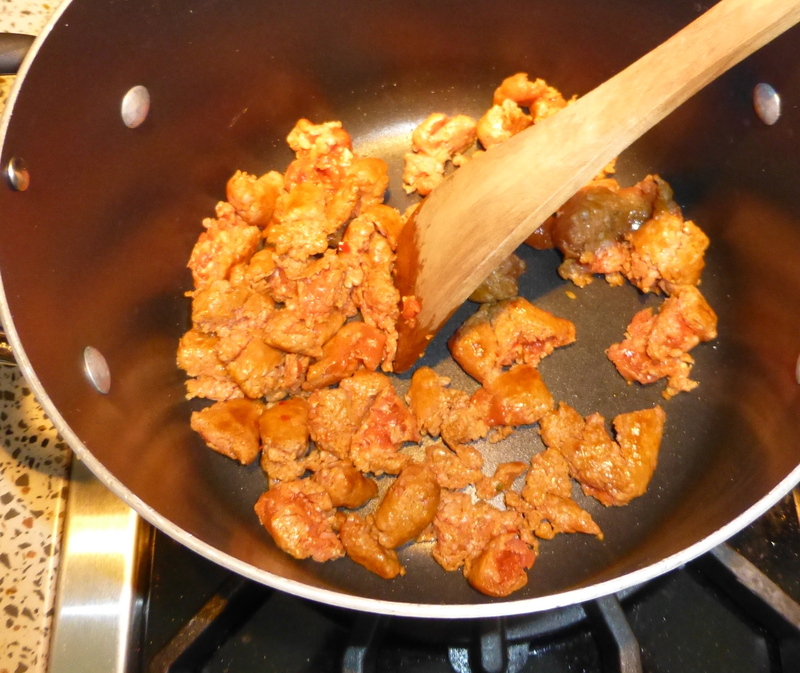 Once Cholula approved of the sausage’s status, I added the tomatoes to the pot. 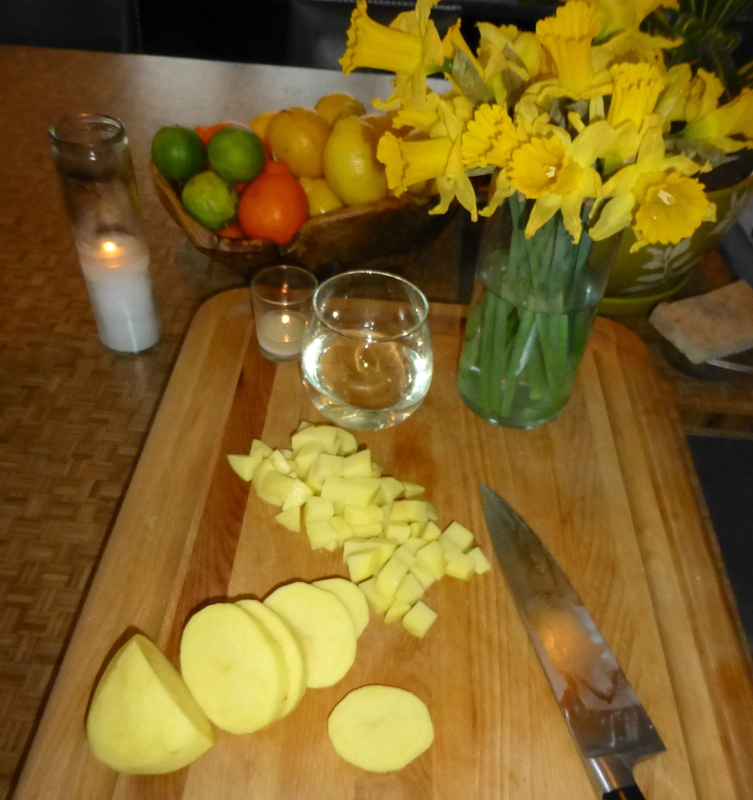 Then came the potatoes and a quart of chicken stock. 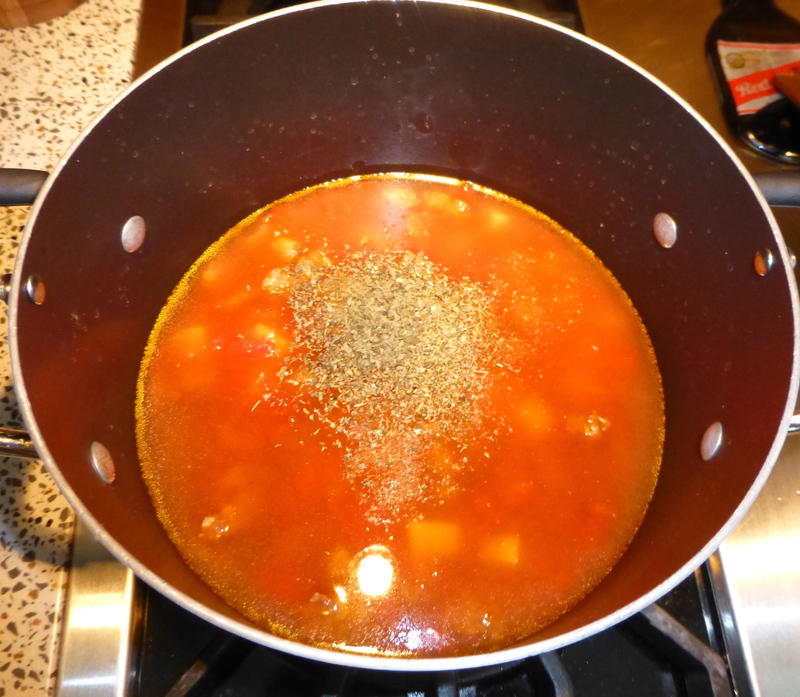 Since I didn’t know what flavors these particular sausages would have, I added some dried oregano and basil to the soup. 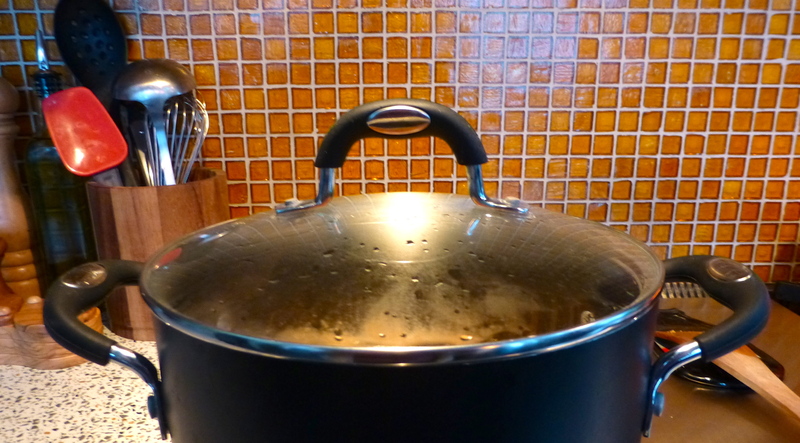 The soup came up to a boil, so I turned the heat down to simmer and put the lid on the pot. I wanted the potatoes to have some time to get tender. 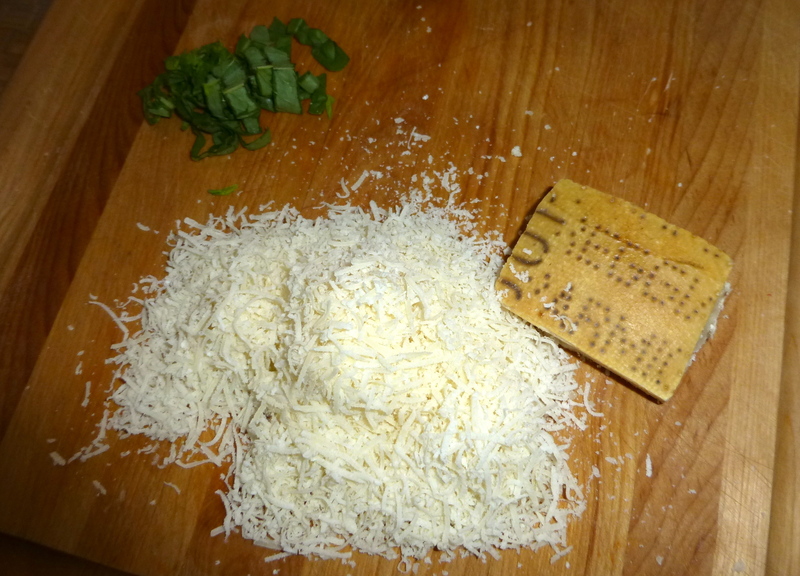 I shredded a big pile of good parmesan cheese and chopped up some fresh basil. 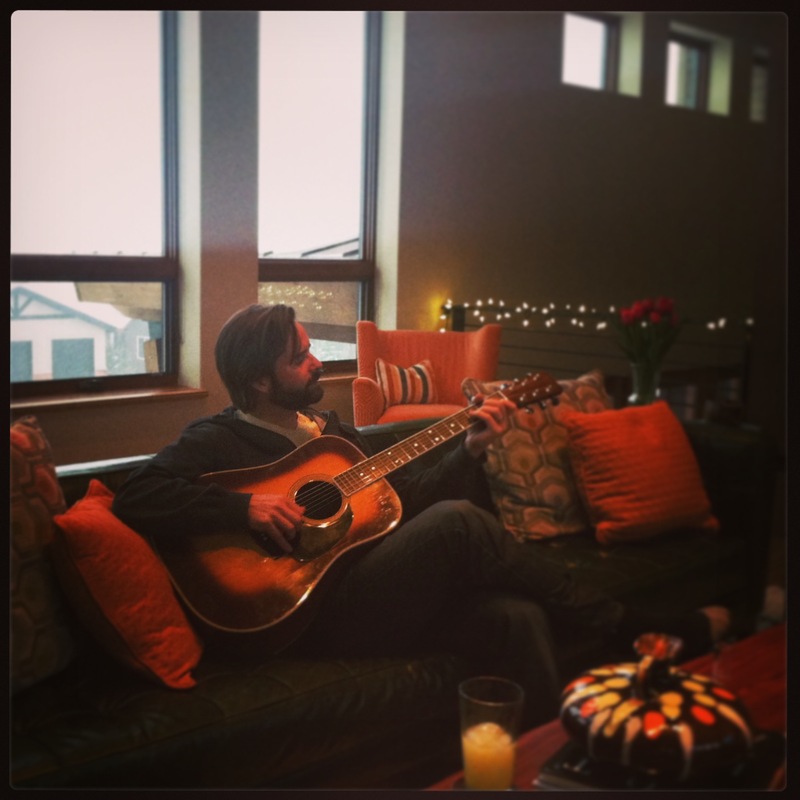 John took the opportunity to sing me a song and the snow kept falling outside. How dreamy is this? I stole a potato and tasted it for doneness. Yum. Into the pot went most of the cheese and a smidge of the basil- I saved some for garnish. 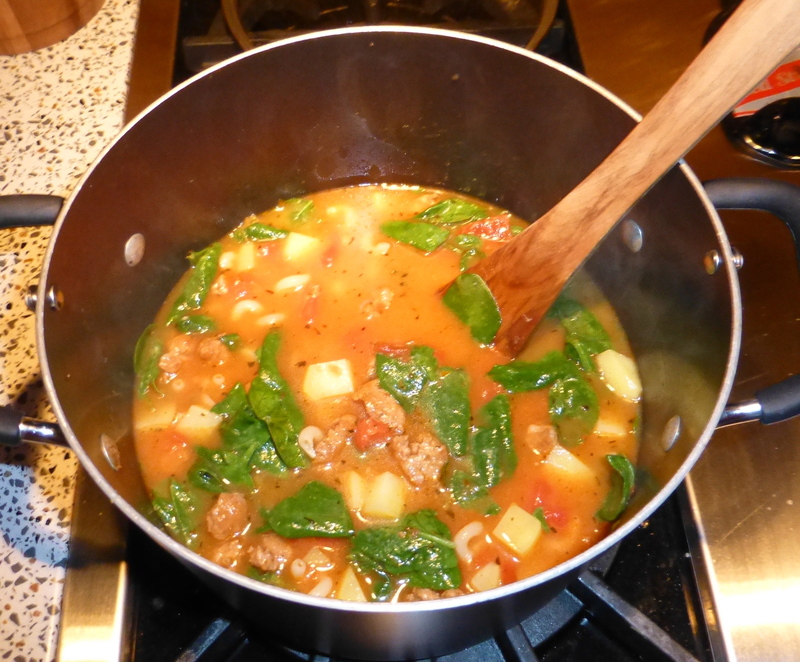 I also added what seems like too much spinach, but it quickly wilts perfectly into the soup. 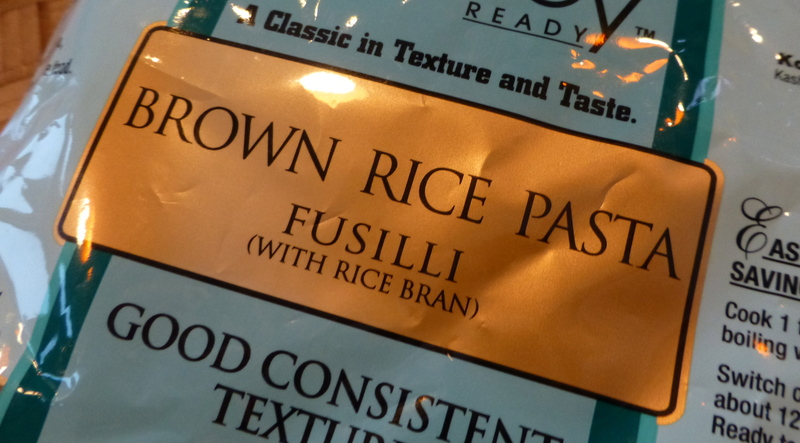 Project Reduce Gluten required that I use these brown rice noodles, but I’d had a good experience with them when I made macaroni and cheese. Since I’d added potatoes this time, I reduced the amount of noodles and added them toward the end. When the noodles were done, it was time to eat. 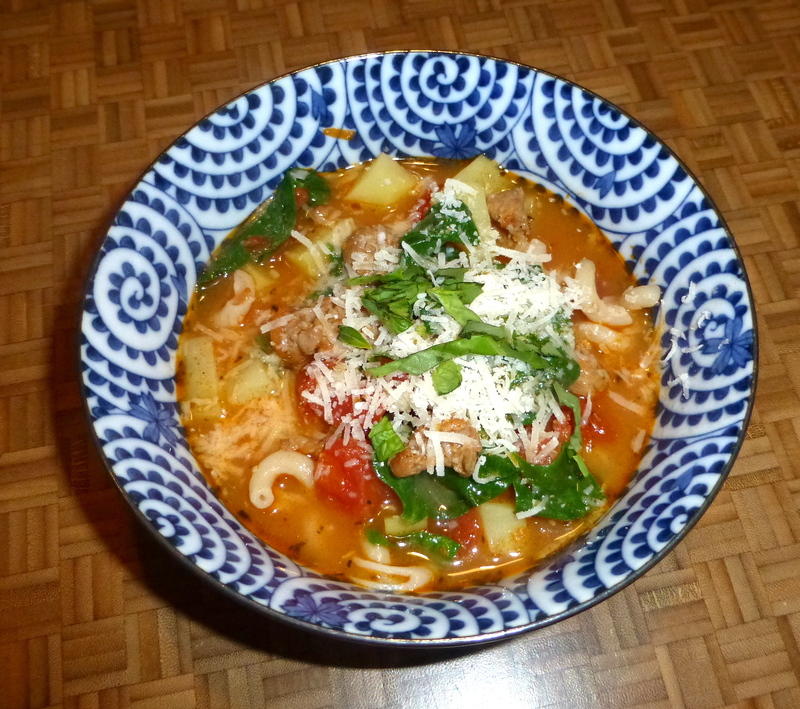 I topped each bowl with more parmesan and a sprinkle of basil. 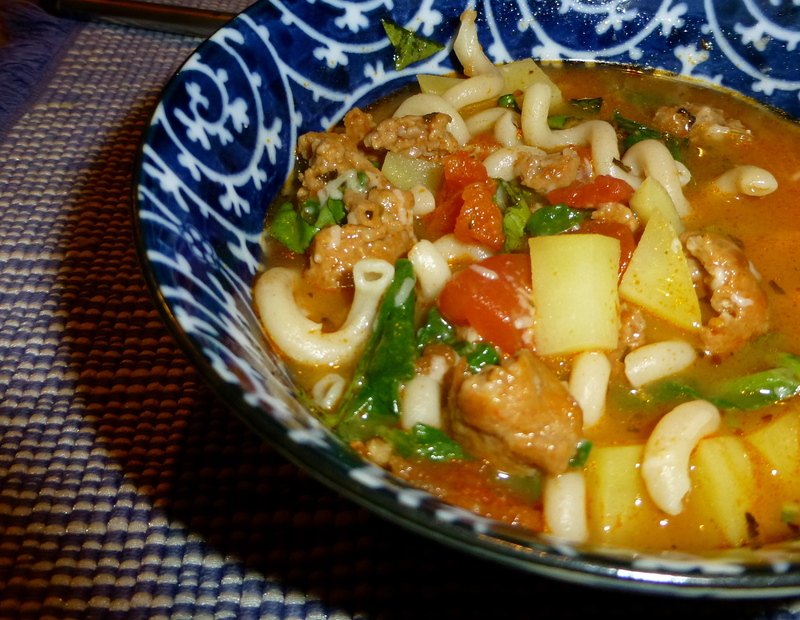 The flavors of the sausage and the chicken stock somehow come together into a spicy, rich base. I liked the chunkiness that the potatoes brought to the soup- they made it hearty and filling. Don’t skimp on the cheese- the salty tang really adds to the overall flavor. Positively delicious– and so easy. 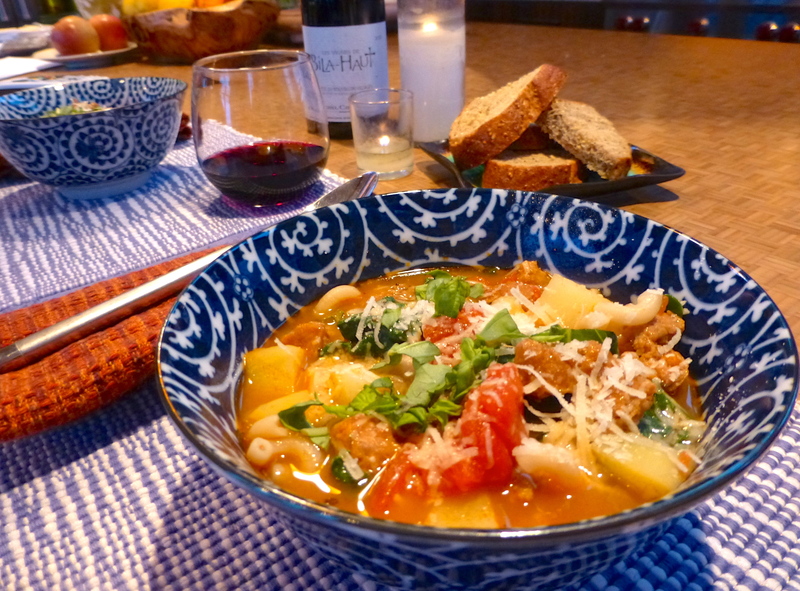 This soup was a home run from the first time I made it, and I always think of Liz when I do. Our friendship may have taken years to develop into something fabulous, but that’s why it’s so special. I know it will last. Unlike the leftovers. It’s another day for slippers and soup. 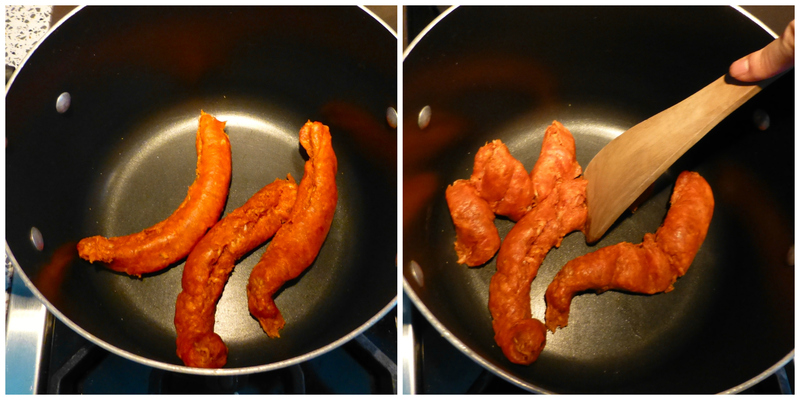 Brown sausage in a large pot. 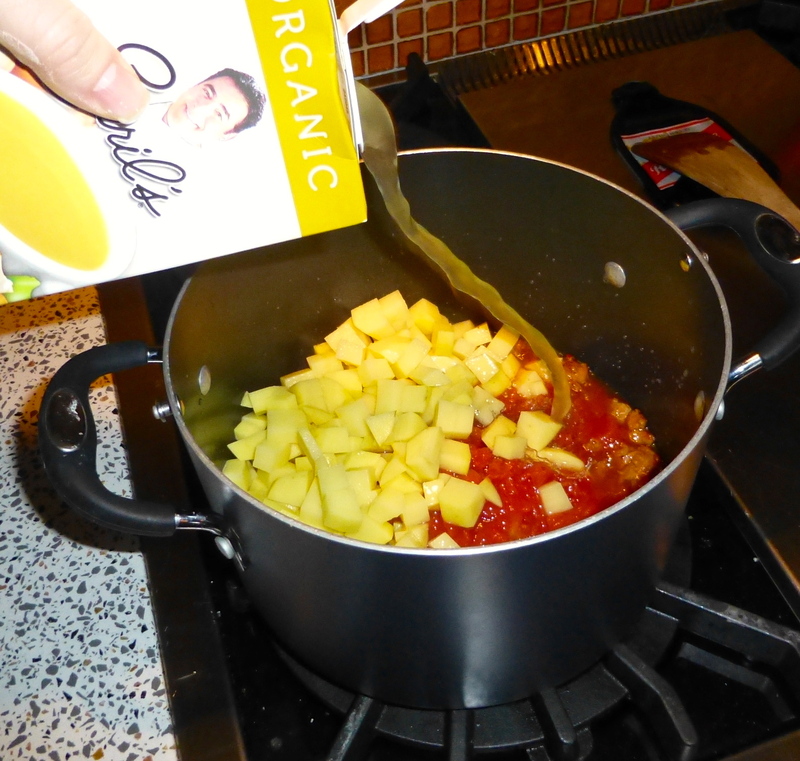 Add tomatoes, potatoes, and chicken stock. 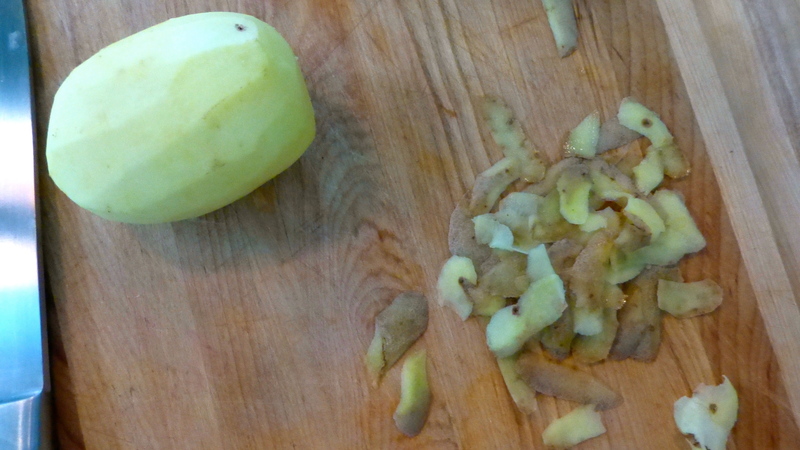 Cover and simmer until the potatoes are firm-tender. 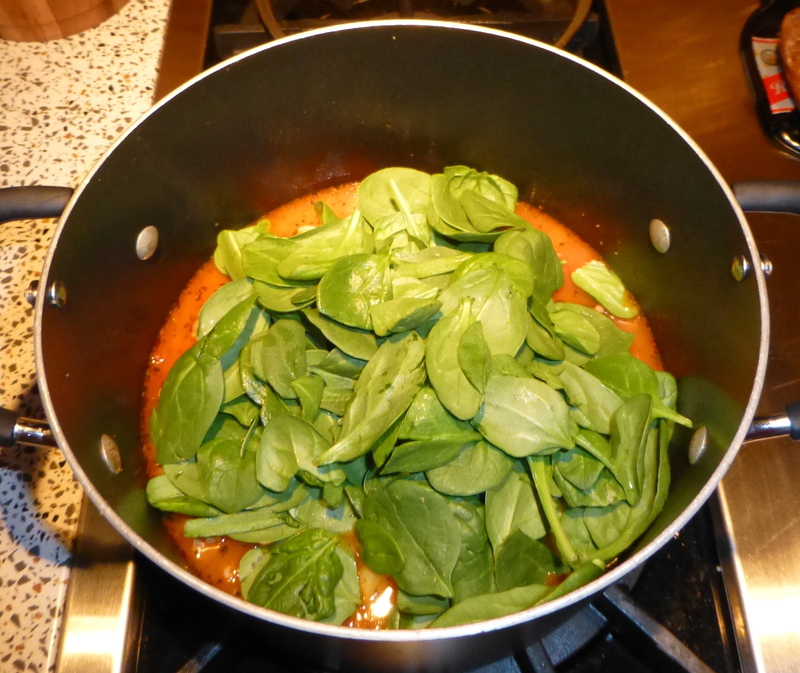 Add most of the cheese, some of the basil, and the spinach. Stir until the spinach is wilted. Add the pasta. 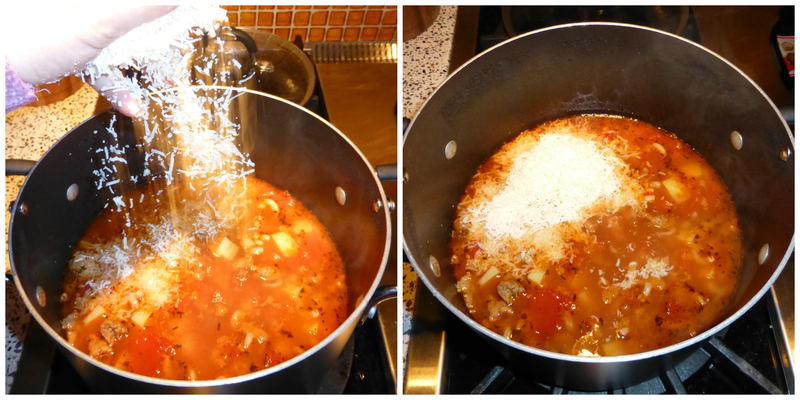 When the pasta is done, serve in bowls topped with the remaining basil and Parmesan cheese. Don’t forget your slippers. Yum! Previous postScrambled in the sun. 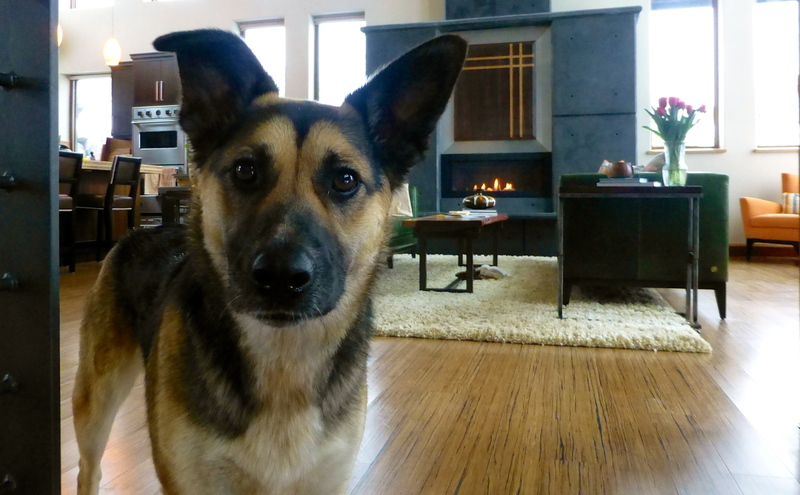 Anytime there’s meat cooking in the kitchen, be careful not to step on Cholula! I agree- the friendships that grow mean so much. Thank you! We’re getting some wild and crazy weather down here, too! I wish I had the ingredients to make this… so perfect for a day in like today. Aw, I loved the tale of your friendship with Liz. You’re totally right that sometimes, you just hit it out of the park with another person and you KNOW you’re meant to be friends—even if it takes a while to get to the level of an intimate friendship. Every relationship has a story- it’s interesting to think of them all regarding friends in my life!